Working from my home studio in the glorious Devon countryside, I design and make a range of women's knitwear in natural yarns. I love mixing up the colourways, often using 2 or 3 or even 4 different colours of 1ply yarn to create Cardigans & Jumpers. 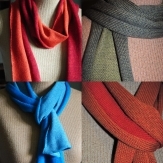 Most of my scarves are 2ply so these only come in a mix of 2 colours. My latest scarves in Merino wool are knitted in a semi-reversible way so that one side is prodominantly a different colour from the other. As they are knitted together there is a little blending together of the 2 colours but there is a distinct difference, making them twice as useful. 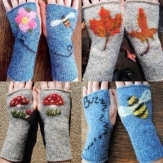 My knitted Mittens with felted details are all hand done by me to original designs, each one varying. I tend to do different images on each hand for complete originality. I have lots of cones of yarn to choose from, above is just a small selection. Ponchos in Linen/Cotton mix have been really popular and so easy to wear... spring/summer, autumn/winter, just layer over vest tops or jumpers or even coats. Some items like those above, are one-size fits all, but my cardigans and jumpers usually come in a range of sizes and I can do different sizes to order along with sleeve length etc. So these really need to be tried on unless you've had one from me before and know how my sizes work. I do a number of shows through the year mostly in the SouthWest and a few in the SouthEast, so please check my 'Events' page and see if I'm anywhere near you soon.